The Jan-Feb Issue is LIVE! It’s only just begun, but 2018 is fixing to be a pretty epic year. For starters, the Winter Olympics are set to take place in February (check out this month’s Numerology for a look at some odd, interesting facts about the Winter Olympics over the years). It’s been a mild start to the season in the Rockies, which means the snow is on its way, and this issue has everything you need to know about the best backcountry skiing in Colorado, the ultimate gear to safely shred out of bounds in, and the hot spots that some of the top adventurers in the state go to play. 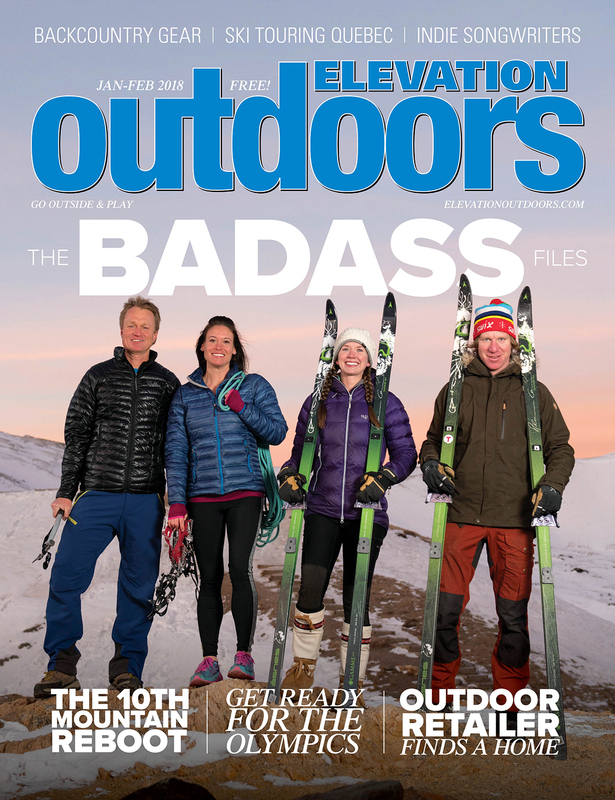 Our Jan-Feb issue is also packed with info on Outdoor Retailer’s big move to Colorado, epic powder in Quebec, and the big reveal of the six Colorado residents voted the most badass in the state in our annual Resident Badass poll. Grab an issue on stands now, or read on for a look at Elevation Outdoors Magazine’s first issue of the new year! Maybe we should listen to the locals. Once a bizarre niche sport, dry-tooling—using ice tools on nothing but bare rock—is gaining in popularity. A Colorado company is saving the history of skiing, one retired lift chair at a time. Small town charm oozes from the top of Mount Princeton to the banks of the Arkansas River. This Paralympic champ helps disabled kids dream gold. Take a front row seat at one of the planet’s greatest wildlife shows. The Outdoor Retailer trade show will bring a big economic boost to Denver and the state of Colorado. But can it bring even more business to the state? Can it create the political might to have a say when it comes to America’s public lands? Looking to up your game this winter? We asked some of Colorado’s top mountain athletes about their favorite big outdoor undertakings. Now you can follow in their paths. Download the free ViewRanger app and follow this route to reach the top of a Colorado winter summit and spend the night in a 10th Mountain Hut. We sought out these odd and interesting facts and figures about the Winter Olympics and Colorado in preparation for this year’s games in PyeongChang, South Korea. The head coach of the U.S. Freeski Halfpipe Team tells us what to watch in the Olympics and how resorts can grow the often misunderstood sport. These gritty, determined Colorado athletes raised the bar for everyone over the last year. But it was not just physical feats that got our attention. Read on to see what it takes to pull off the top athletic achievements in the state and be named to Elevation Outdoors’ roster of biggest badasses out there. Want a winter escape with zero avalanche danger and a favorable exchange rate? Point your tips to Quebec and the chill backcountry of Mont Tremblant. Whether you’re tagging uphill laps at your local resort or touring deep into the wild, this new, lightweight gear will get you far and away—and back home again. Start planning your year of adventure now with our complete race and event guide. The Boulder International Film Festival pairs up-and-coming singer songwriters with talented young directors, making it an ideal venue for listening to new music. The 10th Mountain Division’s return to Colorado aims to renew the deep ties between soldiers and skiers. The U.S. ski team has become a powerhouse and a favorite to bring home a full haul of medals from Korea. But a roster of legendary skiers got us here. The December Issue is LIVE! The November Issue is LIVE! The October Issue is LIVE!